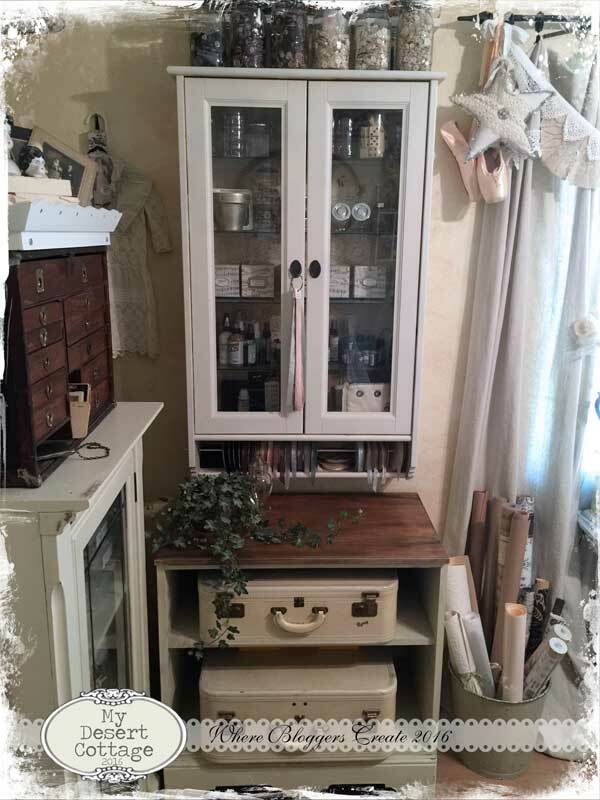 **My Desert Cottage**: Where Bloggers Create 2016- Welcome to my studio! 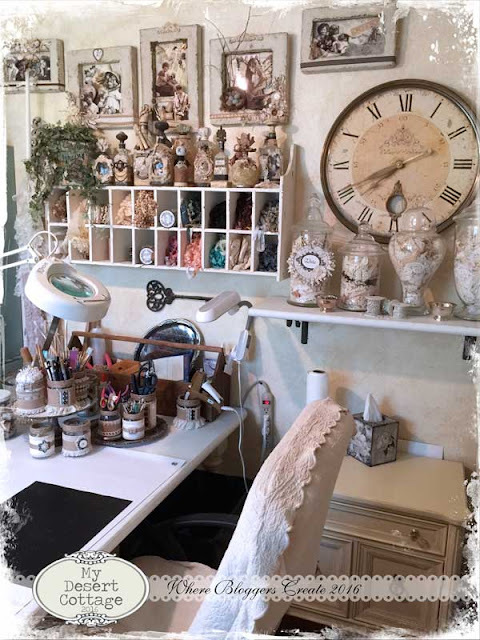 Where Bloggers Create 2016- Welcome to my studio! Hello my friends and welcome to another Where Bloggers Create party! One of the things I hear most often from you is how the party has been the catalyst for you to clean, fluff and organize your studio spaces and for me this year was exactly that. My studio was a mess a few weeks ago. Mostly because I had seriously outgrown my space and had no where to put things. I have a hard time working in chaos, so I hadn't been doing much of anything in my room. That needed to change (I really missed being in there) so I did a major purge of anything that hadn't been used in a few years. I know that there are a lot of purely decorative things in here, but they make me happy so most of that stuff stayed! One of the things I removed were the 2 paper storage cubes that used to be under the window. They held scrapbook paper and since I don't do that anymore, I rarely needed to get into those boxes. I had a 2 tiered table that was going to go into my shop, but it found a new home in my studio instead. It is easily movable and can be placed beside me at my work table to offer an extra surface for supplies while I'm working on a project. This was, (I believe) an old microwave cart. I picked it up at a garage sale for $5.00. All it needed was a coat of white paint on the wood top, and it was perfect for my studio. Because its a pretty small room, I like things to have wheels so they are easy to move around and out of the way. Inside the cart is an antique basket that for some reason did not sell at the shop. I brought it home and it fit like it was made for it! Now it holds Christmas trees waiting to be turned into something glorious! Inside this sweet little cabinet are all my glitters and glitter glues. I also love using vintage shakers to hold some of my favorites. This little cabinet holding the vintage suitcases in a new addition. I have all my encaustic wax and soldering supplies in one, and some of my Christmas stuff for making my trees and other holiday goodies in the other. The cabinet above it holds assorted supplies and the little opening below it holds my seam binding on rolls perfectly. I call this my bling box. I assume it held hardware and tools for some guy years and years ago. Now it holds all kinds of blingy treasures for embellishments or jewelry making. 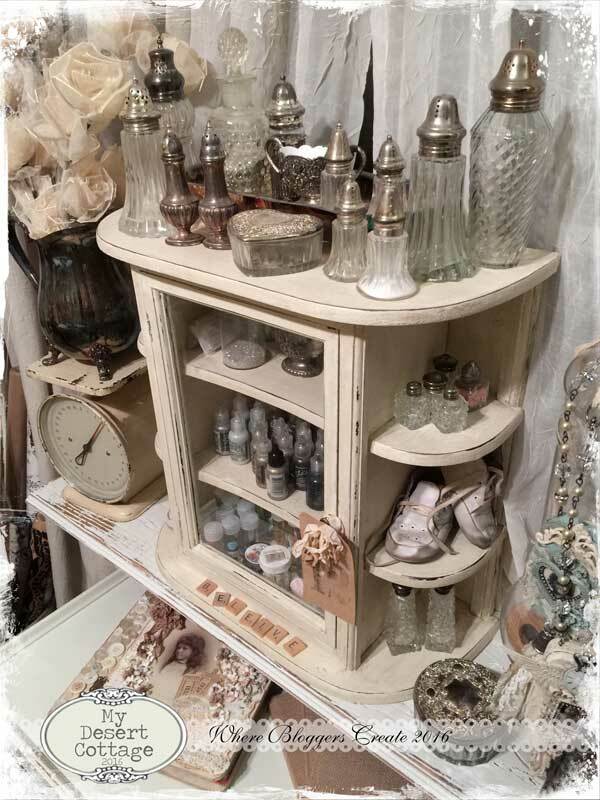 Embellished jars hold all my tools and this wall cubby is perfect for holding already antiqued and crickled seam binding. Another addition this year was this vintage ironing board.I painted the top to match the table. It provides much needed extra work space for holding things like my trees as I finish them. My fabric stash is pretty much at its max, but I keep buying it when I find great pieces! You never know what you are going to need for a project right??? This is probably my favorite piece in the studio. 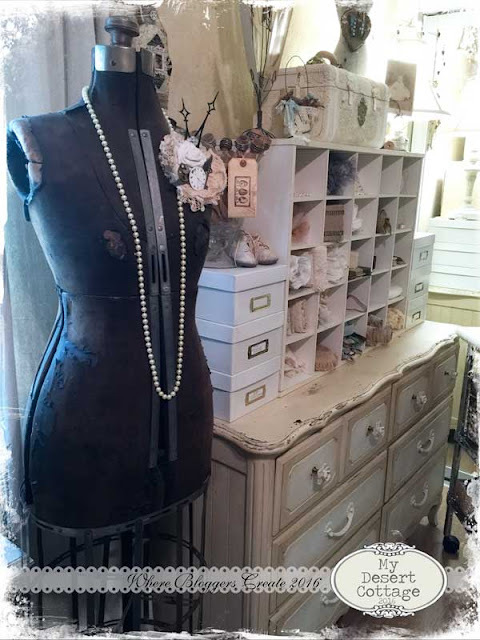 The card catalog holds all kinds of metal doodads and the cubbies above are full of vintage lace. I'm pretty stingy when using it. Its so pretty I find it hard to cut up or let go!!! Cheese boxes are great to hold small pieces. Plus... I just really like the look of them!!! I think we all know where this came from!!! I wish I would have bought one of the cream ones when they came out, but I didnt. 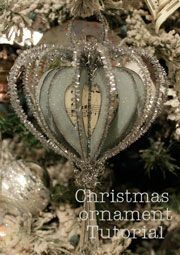 It holds more embellishments for the Christmas trees. I'm getting ready to go into full on production mode very soon! If I dont start now, I wont have enough time to make all that are needed without going crazy!!! And last... (but definitely not least) my sweet baby boy and constant companion Cooper. He keeps me company while I am working and pretty much never leaves my side. (They don't call Welshies the velcro dog for nothing!! ) 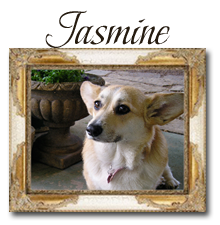 Jasmine comes in a visits from time to time, but she is usually sleeping on the cool bathroom floor. Well that's all for this year. I hope you enjoyed the tour and have a wonderful time visiting all the party guests!! I know I will!!! Thank you so much for hosting this party for us again for yet another year. I just managed in the nick of time getting my new downsized studio almost ready for viewing after a shift from a country property to a suburban property. 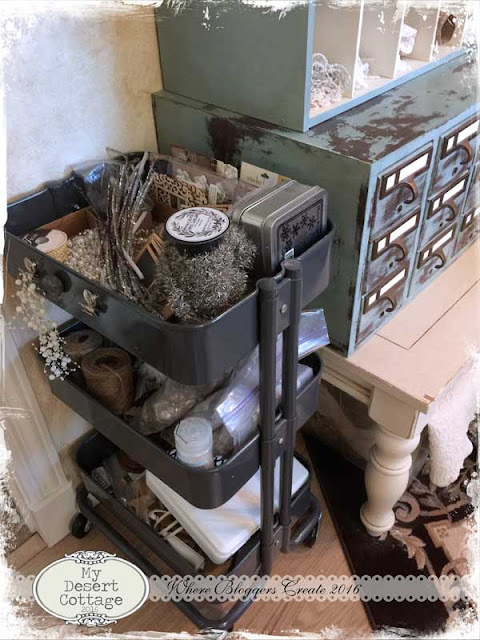 I love, as usual, coming here to see your beautiful place of creativity and all of your delightful storage ideas of cubby holes, boxes, trays and trolleys all giving us great ideas for organizing our necessary materials to create. Hope you enjoy the party as much as I do. I wanted so much to post for the 4th year, but we have had 3 different sets of house guests to far in July and I just didn't get it done. But at least I will be inspired by all the fun posts. Thanks for hosting Where bloggers create again. As you mention, I use the deadline to get my workroom organised and tidy, with out it it probably wouldn't happen! 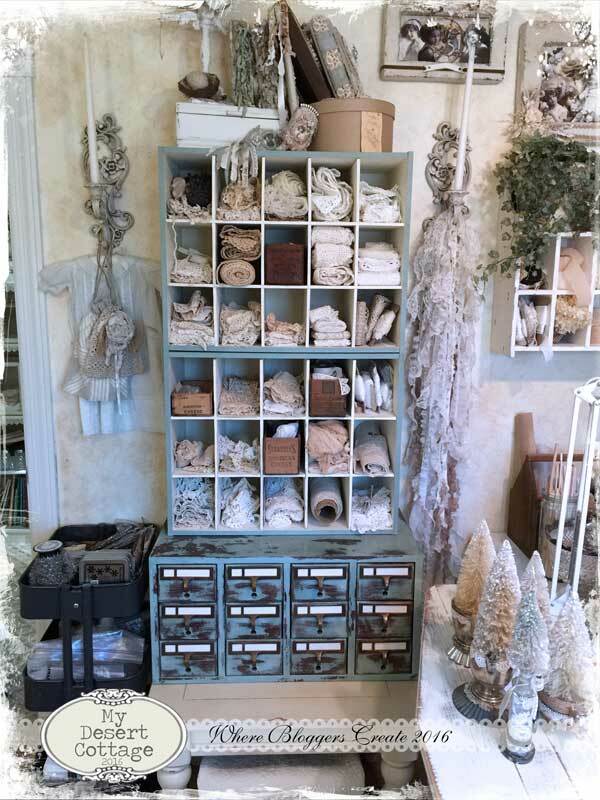 Your studio looks beautiful as usual and I love all of your storage and it's gorgeously coordinated! 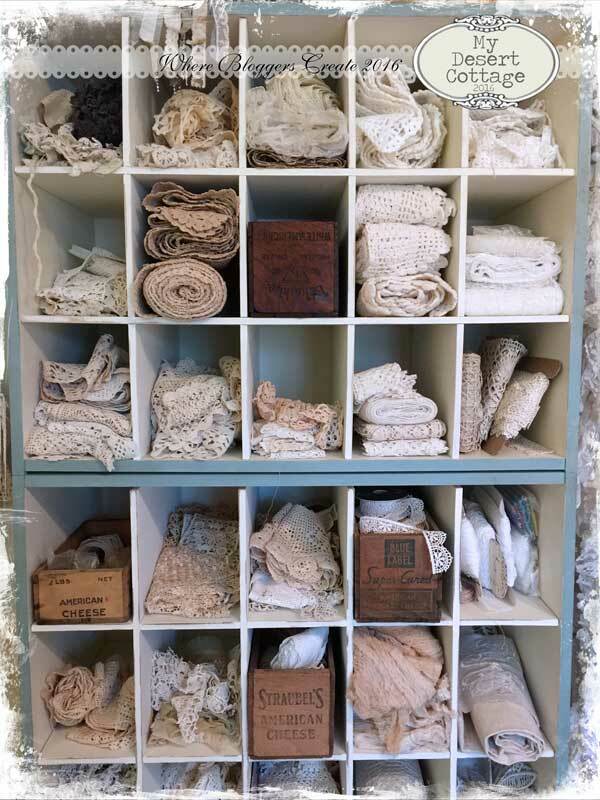 I'm a tad jealous of your vintage lace collection, I have some, but nowhere near the amount you do! I am so excited to be joining this event for the first time. I had no trouble with your instructions - at least, it looks like I've managed it correctly. Please let me know if there's anything I've forgotten. 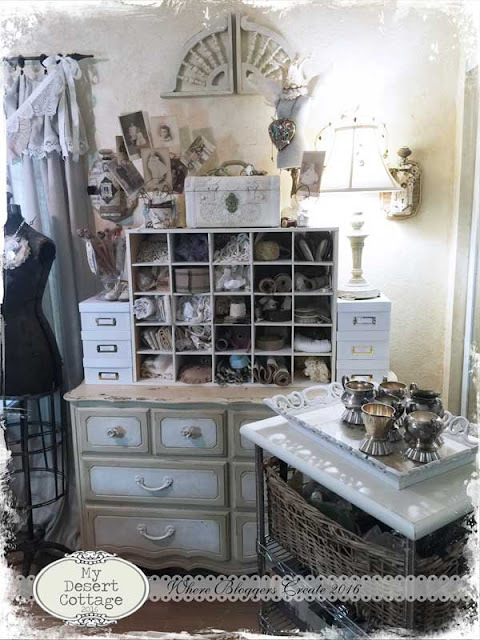 Your tattered and worn drawers and cubbies full of lace and yumminess are glorious! I am going to show my DH your blog to prove to him that I am not the only woman who enjoys surrounding herself with inspiration! Your blog is quite divine. Thank you for hosting again this year. Thank you for hosting this party! I love your microwave cart and your vintage ironing board. My husband turned our old microwave cart into a wine cart. I will do a post about that. I have my vintage knitting machine attached to an ironing board. It would look gorgeous on a vintage ironing board. I will have to keep my eye out for one. You always inspire me! 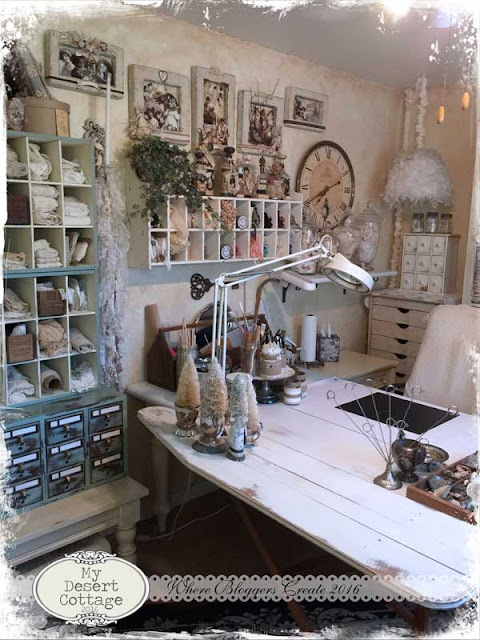 You have such a lovely crafting space! I love the suitcases and the card catalog. And I also have that Ike cart... I loved it so much I bought 2 in turquoise. Happy Friday and thanks for hosting! Your studio is breathtaking and just leaves me speechless! Hi Karen, I am always elated at your space! Eye candy in each and every corner. Love this party and always get inspired by visiting others creative spaces. My photo did not show up for my linky. Not sure why, but I've had that same problem with one other party. If you get a chance, go ahead and delete it and I'll try again. Thanks! Your space is beautiful. I just recently cleaned mine up. I just saw the Share Your Space party link on "Thrift Store Addiction" blog and had to pop over. I love carts too. 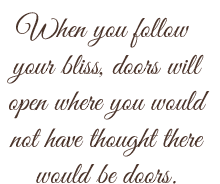 :-) We are in the process of closing in part of our barn for my art studio. I can't wait to get it done so I can set everything up. Your space is full of inspiration and I can't wait to see the others. Thanks for sharing and hosting! I always have been inspired by you and your studio and its collections. I love the wicker basket in the metal stand with a table top and oh so much more. It sure is eye candy for all, and thankyou for hosting this again. 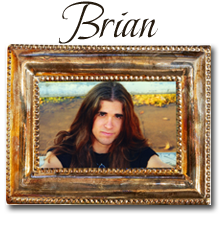 I have been absent from blogland quite a bit in the last year, but I am back now. Hope you are staying cool in that Arizona Heat. Hugs to you Karen. I am so happy that you decided to have another party, Karen! Last year was my first time to join in, and I met some lovely creative ladies and made some lasting friendships. Your studio is incredibly amazing and certainly doesn't look like it would be located in the AZ desert! I'm an AZ desert-dweller also. It's so great and a necessity for us to have these fun (and well air-conditioned) spaces to escape the heat and make pretty things. Thanks again! Also, thank you for a tour of your grand studio...my, everything is so beautiful and dreamy! I love your many ways for organizing and seeing all of the lace tucked here and there makes my heart sing. Have a wonderful weekend! Hugs and joy to you! Ah... your space is so lovely! Thank you, once again for hosting this fabulous show and tell! You're the best! Hi Karen, Your space is as beautiful as ever and I love your new additions. I also have the ironing board and was just thinking of adding it to my space too. It looks great in your studio. 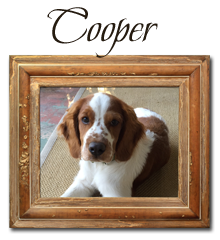 I'm so glad to see Cooper in your post. Such a sweetheart and gorgeous. I always enjoy looking at your images of your studio. And good luck on getting all those brush trees made for the Holiday season. I have mine in an open cabinet because I didn't want to pack them away where I couldn't see them. I love them so much. Your work is always FANTASTIC. 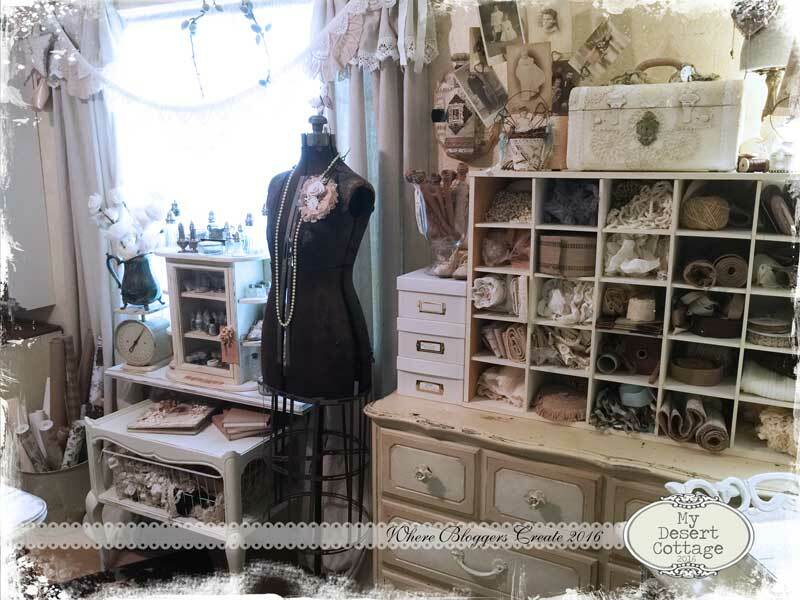 Your studio is every girls dream...such a beautiful place and so wonderfully filled with treasures. Thank you so much for hosting this wonderful party. I appreciate you so much. 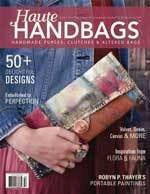 A person could immerse themselves in your craft room Karen and forget about time and responsibilities. Although not participating this year, I'm planning on visiting others to glean ideas for my craft area. Thanks for hosting, it's always a fun and inspirational party. What a gorgeous studio space! First of all, thank you so much for hosting this event. You got so many of us in "gear" to clean up our studio / craft rooms!! Mine hasn't been this clean in years! Your studio is amazing, Karen! 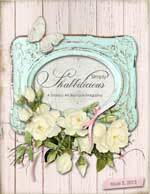 Your amazing vintage rhinestone stash is to die for! Your studio is always dreamy. I love love love your lace collection! Thank you so much for your devotion in hosting this wonderful event dear Karen. Have a beautiful weekend. 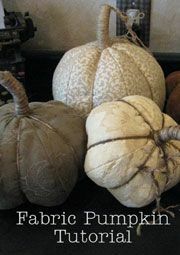 This encourages me to get in my studio and fluff it up and take some current pictures. My studio is a very large room and doesn't look cozy as yours. 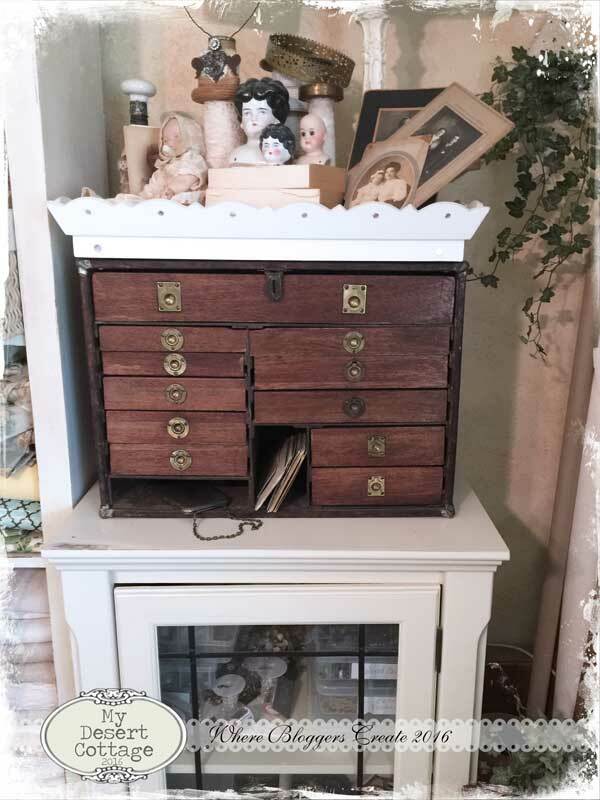 Where you have small cubby cabinets which I love I have chest of drawers and old china cabinets and amours full. 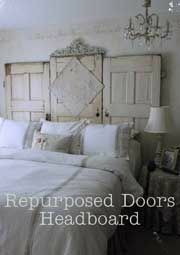 I have been decluttering an giving things away. I love all the changes Karen! I want a glitter area! Your trees are so special1 Blessings on you!! Oh Karen! Guess what! I was telling my dear friend about your ironing board this morning, and she said that she has one in her garage that I can have! She said that a neighbor gave it to her about 20 years ago. I can't wait! Thank you for sharing your's. If you had not shared your's I would not have acquired mine. Found your lovely post through Stephanie's post, and just wanted to stop by and say how much l enjoyed seeing your work room. You have so many lovely things to create with and everything is displayed so beautifully on and in the drawers and shelving, your whole room is a work of art. 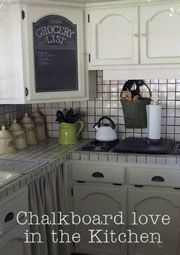 The ironing board idea is fantastic and how wonderful to have your four legged friend to keep you company while you work. Thank you for hosting this hop again this year. I really look forward to it each year. Your studio is lovely and romantic. Love you vintage dress form. 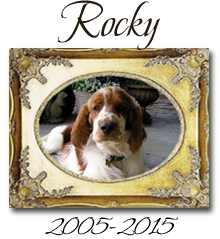 Thank you again for hosting this blog party. I haven't had the chance yet but will visit all of the creative spaces. I always enjoy seeing your beautiful studio. I don't know if I have ever mentioned this in a comment but yours was the very first blog I "bookmarked" when I first learned about blogs, before I started blogging myself and following others. Thanks for your inspiration. Sometimes, as in your blog comments, I get so involved in reading all the comments I forget to do so myself. Be amazed what can be learned about a blogger just by reading all the comments. Is very encouraging to read comments from people who say lovely things and there were so many of them. 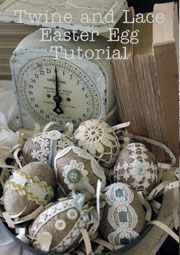 Know what you mean about the lace, I have hard time using lace have had but hard to make project if I don't let go of some of supplies, as in buttons I love, silly me. Some of it have lugged around country when we've moved, not just once. Have figured out best way for me to be able to even walk in my sewing room and studio is to put most of "stuff" in storage garage then little by little bring things back. My problem is those two rooms are so tiny, storage solutions do have need to cleaned out, organized. Been wanting to do sewing but can't the way sewing room is. Your post today is very inspiring. Things have gotten away from me terribly, so need to bite bullet. You did a wonderful job on your room, send me some extra energy would you please? I enjoyed visiting your studio and am now dreaming of changing my space around.You have so many creative ways to display and use your materials. The glitter in vintage salt shakers was a particular aha moment. This year I had hoped to join you, but just as I was ready to photograph, chaos hit the room. I plan to take photos whenever I can this year so I can join you next year. 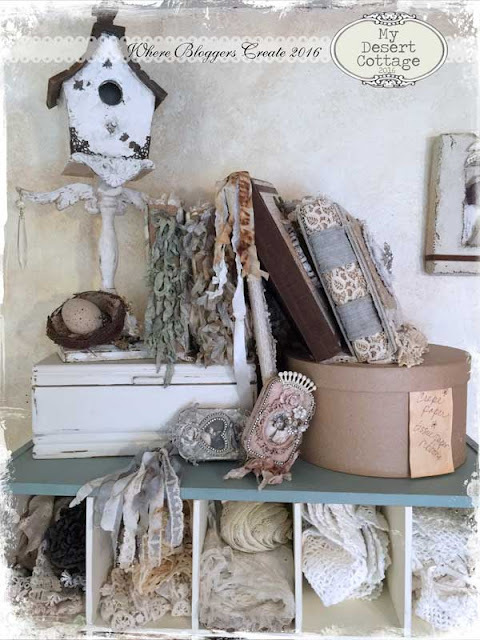 Absolutely love your lace wall! Beautiful space. Thank you for hosting this fab event! I adore your "creative space", dear one! 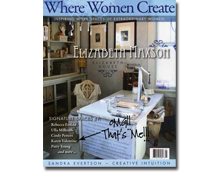 I first found your Studio in Where Bloggers Create publication years ago! You have been a continual resource for changes made to my own creative space, Studio One, ever since! Thank you for sharing your inspiring blog, as well! 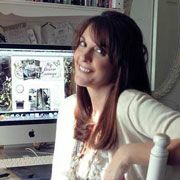 Thank you, for once again, hosting Where Bloggers Create! Great new piece Honey!!! Loved seeing what you changed up!! It all looks Fantastic!! Love the ironing board!! 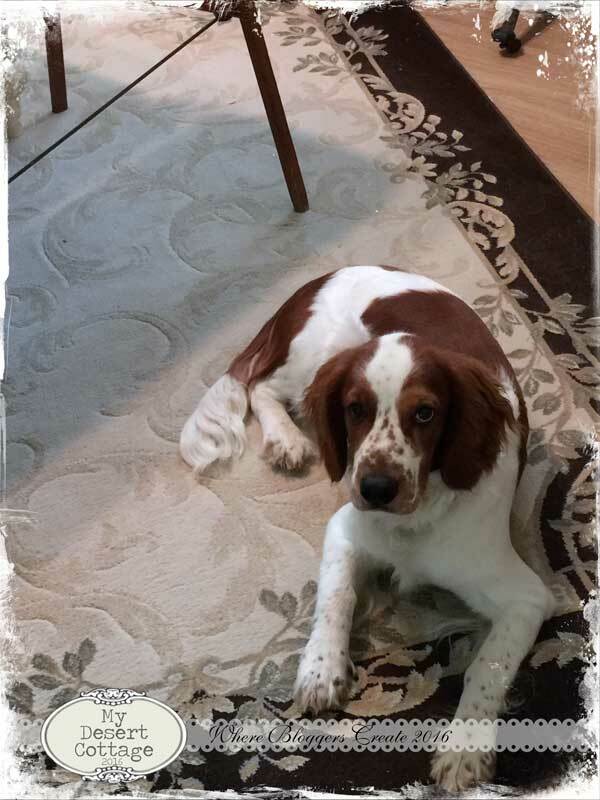 Cooper is starting to look like a big boy now...how fast he is growing up. :0) Thanks for hosting this great tour again this year....Big Squish...and many poodle kisses!!! 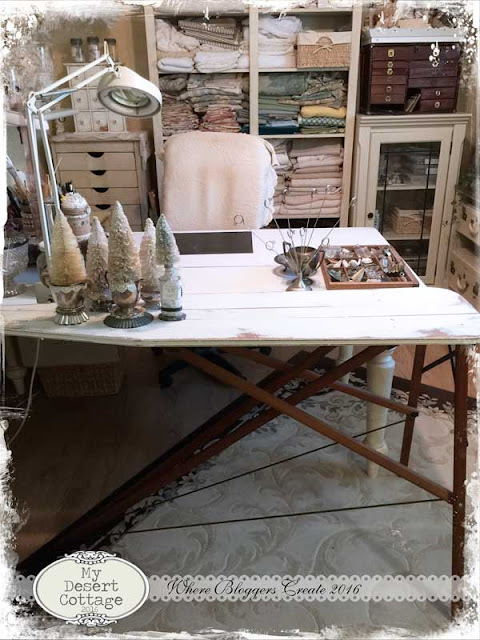 Fabulous work space!! I am so inspired!! 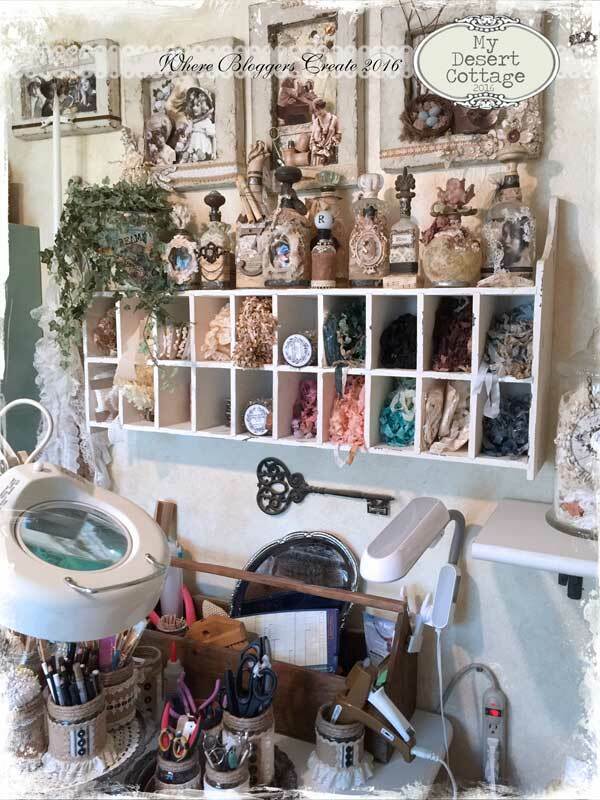 I am getting ready to move to the Oregon coast and so that will be a perfect time for me to make some major changes to my studio!! Thank you for a wonderful tour!! Thank you for hosting the tour - I know it's a ton of work to organize and I know everyone who is visiting around right now definitely thanks you. I loved peeking into your creative space - and was happy to see that wonderful wooden ironing board. I inherited one from my mother, who inherited it from her mother, but had to let it go when we moved into this apartment. Really wish I could have found space for it! Hi Karen, Your studio is a always an inspiration. 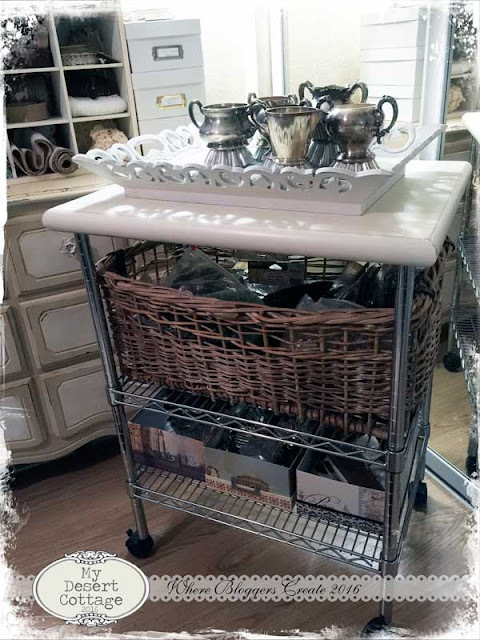 I love your repurposed Microwave cart. How perfect for a busy studio. 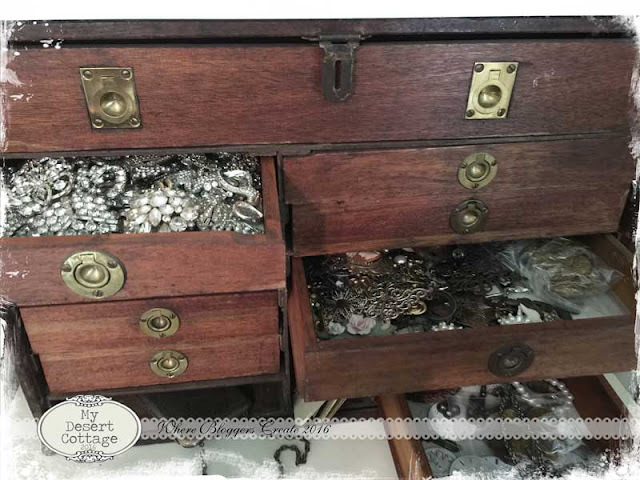 Probably one of my favorite things is your bling box. Drool worthy!!!! Missed being part of this this year, but will still enjoy peeking into the work-spaces of all those who did participate, and Gaia and I will both be back if you do it again next year. The room we expect to use in the "new" (built in the 1970s) house, is huge, and we hope to make it both useful and awesome. I am so sorry, your was of course the first room I visited and I was so excited about WBC being back that I jumped ahead and forgot to comment on your page! 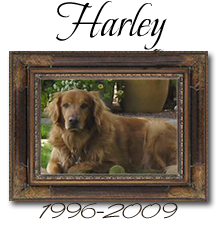 Your room looks lovely, as it always does, but I loved that you pointed out what you changed and why, and of course I love your sweet puppy who is always with you. I lost my beloved kitty this year, and it just is the same crafting without him. Thank you for putting together this party each year. I look forward to it every single time and have made so many lovely friends through it, I know it is a lot of work for you and I truly appreciate you hosting it every year. I want to participate, but every year for the last 4 years I have moved just a few weeks before. This year was the 4 th move and I frankly is miss only couldn't get the room set up or unpacked in time, if by some miracle I feel well enough to get it done this week, I will link up, otherwise it WILL happen next year. In the meantime, I am enjoying seeing everyone else's spaces, and getting lots of good ideas for my own from each of them. I love that you do this. Your studio is lovely! I participated many years ago. I wish my studio was a little cleaner and more organized so I could show it this year. It gives me something to aim for! No matter what you do to your room, I love it! I couldn't join this year, the first time in a long time. Next year, I will. Thank you for hosting this party, Karen, and for not giving it up. I've followed it for years, but this is my first time to join in. I hope my studio insires other like me to keep on creating even though they don't have an "offical" artist studio. My back porch studio works for me right now and makes me happy, happy, happy. Hi. Thanks again for the party and thanks for emailing me to let me know my link didn't work. I've fixed it now (hopefully) I linked again. Sorry I messed up before. Have a great party. Your studio looks stunning as usual. 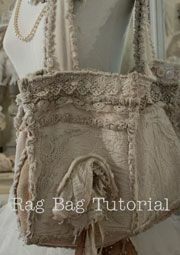 I covet your lace collection! I love your peaceful colors. Thanks so much for hosting this event again this year. It is truly inspiring to meet so many crafters. First time linking up (thanks to Team Clark)~ Thank you for all the eye candy!! I am a bit late this year but better late than ever!! Thanks so much for hosting!! Your creative space is such an inspiration!! Love your creative space! I am sorry I missed the party, I have been traveling. I look forward to taking a peek at all the links. I always love browsing through your studio. It is always awe inspiring. One of these summers I will be able to participate again. This year I have had my mom here with hospice so hardly get to be on the computer. Hope all is well with you and yours.